라이언 록티와 친구 수영선수들에게 지난 주말에 무슨 일을 있었는지 그 내막을 안다는 말은 아니다. 솔직히 말해, 아무도 모른다. 록티와 그 친구들이 사고를 쳤다면 그들만 안다. 그런데 확실한 것이 있긴 있다. 이 사건에 대한 트위터가 정말로 대단하다는 것. 이런 훌륭한 트위터를 소개하지 않고 그냥 넘어갈 순 없다. 캡션: 록티는 브라질을 빠져나가면서 그의 가장 빠른 기록을 경신했다. Rio: We need to double check both of your stories about this alleged robbery. 캡션:리우 - 강도 사건에 대한 두 개 이야기 다 확인 필요. 캡션: 라이언 록티가 브라질에서 도망치다. Ryan Lochte lied about a night on the town to his mom and started an international incident. I'm dead. 캡션: 라이언 록티는 밤늦게까지 놀았다는 사실을 엄마에게 거짓말 했다가 국제적인 사건이 됐다. 그렇다면 난 죽었다. 캡션: 록티를 턴 강도 스케치. 캡션: 라이언 록티가 말한 게 거짓말이라면 앞으로 강도사건에 대해 누구의 말을 믿을 수 있겠는가? Synchronized swimmers would keep their story straight. 캡션: 싱크로나이즈드 스위밍 선수들이었다면 말이 일치했을 텐데. Matt Lauer: Ryan, your robbery story isn't adding up? For Lochte the unbelievable thing is a 32 year old man still telling his mom the whereabouts of his night out. 캡션: 가장 어처구니 없는 부분은 32살인 록티가 자기 엄마에게 밤에 어디 있었는지 보고해야 했다는 점이다. 캡션: 그런데 지금이야말로 록티를 강도할 적기다. If it turns out Lochte filed a false report, I look forward to people bringing up the case every single time a man says he's been robbed. 캡션: 록티는 가짜로 신고했다. 앞으로 남자가 사기(원어의 '도난'을 사기로)당했다고 할 때마다 이 이야기를 기억시켜 줄거다. 캡션: 라이언 록티는 리우가 이런 곳인 줄 알았나 보다. "harambe, you're alive! but how?" "tell no one ryan lochte, the fate of the world depends on it. just make up a story." 캡션: "하람베. 살아 있었네. 대체 어떻게?" "라이언, 아무에게도 이야기하면 안 돼. 지구의 운명이 달려있다고. 그러니까 그냥 둘러대." @netw3rk Who among us hasnt lied to mom about a night out then doubled down when she went public then fled the country to avoid the police? 캡션: 자기 엄마에게 '스파'에 갔다가 지갑을 잃어버렸다고 시인하기가 뭣해서 그렇게 된 것 아닐까? The Ryan Lochte @serial is going to be good. 캡션: 라이언 록티 시리얼은 정말로 맛있을 거야. 캡션: 라이언 록티에 대한 사실을 지금 전부 아는 게 좋을지 아니면 모르핀처럼 찔끔찔끔 알게 되는 것이 좋을 지 솔직히 말해 잘 모르겠다. I am never going to say "whatever" again without prefacing it, "As Ryan Lochte says at gunpoint,"
캡션: 난 앞으로 "라이언 록티처럼 머리에 총이 겨눠진 상태에서"라는 말을 덧붙이지 않고는 "맘대로 해"라는 말은 절대 안 할 거다. Brazil overthrows elected president in a coup. US shrugs. Brazil drags US swimmers off a plane. THIS MEANS WAR. 캡션: 국민이 선출한 브라질 대통령이 쿠데타로 타도되자 미국은 어깨를 으쓱하는 정도다. 브라질이 미국 수영선수를 비행기에서 잡아 내리자, 이건 전쟁 감이라고 한다. 캡션: 라이언이 자기의 변명을 리트윗하는 것. 웃겨 죽겠다. 캡션: 록티는 무장강도에게 도둑맞았다고 하고 멜로는 그냥 느긋하게 쉰다. Brazilian Police: "And you made the whole story up, didn't you?" 캡션: 브라질 경찰 - "만들어 낸 이야기지? 그렇지?" 록티 - "네." 캡션: 라이언 록티가 자기 엄마에게 말 한 것 대비 실제 상황. 캡션: 더 많은 사연을 NBC가 틀림없이 보도할 거다. 캡션: 4 명 중에 라이언 록티가 가장 똑똑한 사람이었다고? 어떻게? 캡션: 내일부터 내 원래 머리 색으로 돌아간다. 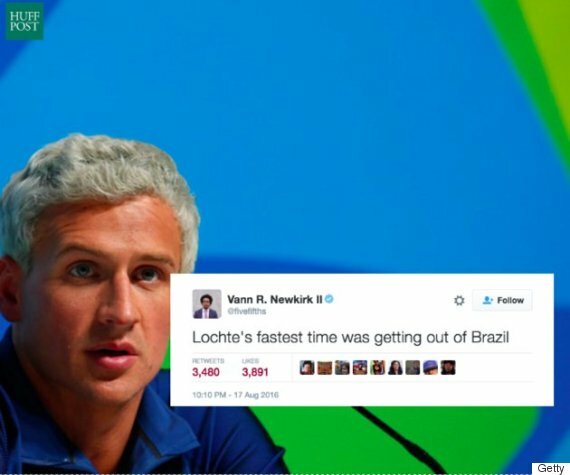 허핑턴포스트US의 'All We Know For Sure About The Ryan Lochte Story Is That These Are Good Tweets'를 번역, 편집한 것입니다.